Free Practice Tests - use Test-Guide.com's Free EMT Practice Tests to prepare for your NREMT/EMT Certification Exams. First Responder– Entry level EMS services. Provides basic first response first aid and patient management. Almost all police and fire agencies require their employees to be first responders. This level is also referred to as Emergency Medical Responder. The main goal of the first responder to is start lifesaving care to critical patients. A first reponder must have the basic skills and knowledge to perform lifesaving procedures while awaiting additional support from higher level personnel. 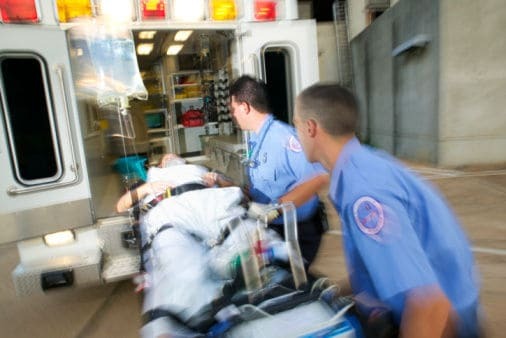 Emergency Medical Responders provide a key role in the overall EMS system by performing basic interventions (with minimal equipment) under medical oversight. EMT-Basic (EMT-B)– This certification level provides basic life support. An Emergency Medical Technician is trained to provide basci emergency medical care and transportation for emergent and critical patients. An EMT-B is certified to have the basic skills and knowledge required for patient care and transportation. EMTs perform procedures with typical ambulance equipment. Advanced Emergency Medical Technicians - The EMT Intermediate certifications are part of the Advanced Emergency Medical Technician Licensure level. An Advanced EMT provides both basic and limited advanced medical procedures and transportation for patients. Intermediate/85 (EMT-I) – NREMT certification level based on the 1985 EMT-Intermediate National Standard Curriculum. Intermediate/99 – (EMT-I) - NREMT certification level based on the 1999 EMT-Intermediate National Standard Curriculum. Paramedic – (EMT-P) – This is the highest level of EMT certification supported by the NREMT. Paramedics can administer a wide range of medication, provide advanced life support, and perform advanced surgical and electrical therapies. as they often are responsible for the urgent care and transport of the sick and injured to a medical facility. EMTs have different duties and responsibilities based on their training and certification. Typically, most EMTs are certified to one of five levels that are administered by NREMT, the National Registry of Emergency Medical Technicians. There are also state by state levels and licensure requirements that may differ from the NREMT’s certifications. Training for Emergency Medical Technicians is available at virtually all community colleges as well as various state colleges, hospitals and private schools. The training is typically a three month course, often taken as part of other curriculum at a college. After your courses, you must take and pass a computer administered national certification exam, known as the National Registry Exam. After successfully completing your NREMT exam, you must obtain a license to work in your specific county. To work as an EMT you must be a U.S. citizen, at least 18 years old and agree to a background check. To attain your EMT Certification from the NREMT, it is important that you pass your EMT test. Try our free EMT practice tests as a study guide for your NREMT tests.